February each year proved that an e-rose by any other name smells mighty profitable. Online buying activity annalist, ComScore.com reported "sales of online flowers for the seven days before Valentine's Day totaled $59.3 million." ​It goes on to say, "The latest week's (Feb. 7-13) online flower sales represented a dramatic--if expected--increase of 460 percent over the average week. 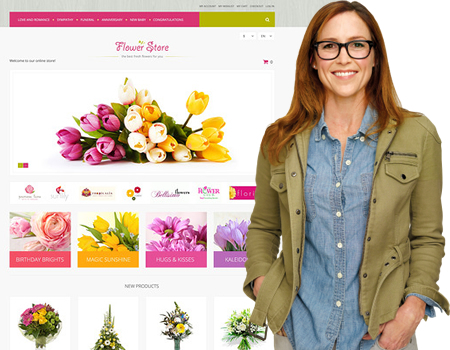 Aided by strong Mother's Day sales and its own cost-cutting efforts, New York-based 1-800-Flowers.com reported a profit, for its fiscal fourth quarter. One of the metrics shows in part how they did it: the company's cost to acquire a new customer declined to $16.88 compared with $23.34. ​1-800-Flowers.com also said that it continued to reduce operating expenses, specifically in the areas of marketing and selling, even as online traffic grew 30 percent during the quarter. Full-year fiscal revenues increased to $482 million compared with $420 million previously. "Despite what continues to be a very challenging economy for retail companies, during our fourth quarter we were able to achieve a solid rate of revenue growth," said Jim McCann, chairman and CEO of 1-800-Flowers.com. "During the period, we reduced all of our operating expenses not only as a percentage of sales, but also in absolute dollars..."
The company said it anticipates total revenue growth for this fiscal year to be 16-to-20 percent year over year. This includes a contribution of approximately $25 million from the Children's Group, a closely held seller of children's gifts which was acquired by the Company. The Children's Group is a multi-channel direct marketer of children's gifts including natural material toys, games, arts and crafts and dolls that had approximately $30 million in revenues. McCann said the company's current fiscal first quarter is traditionally its smallest in terms of revenue due to the lack of any major gift-giving holidays during the summer months. "Because it's a slower period for us, it is the quarter in which we traditionally implement technology upgrades and begin ramping up our marketing efforts for the calendar fourth quarter holiday shopping period," he said. "As a result of this seasonality, for the current quarter we anticipate a return to positive EBITDA in quarters two, three and four and positive EPS in quarters two and four." Classic Long Stemmed Rose Bouquet, 12 fresh-cut medium-stemmed Red Roses, Yellow Roses: Includes One dozen fresh-cut, long-stemmed Yellow roses accented with Baby's Breath. Includes 9 Yellow Roses, 5 Yellow Alstroemeria, 7 Purple Butterfly Asters, and 5 Leather Leaf. Contains 12 fresh-cut, medium stemmed assorted colored Roses accented with Baby's Breath. 4" miniature orange rose plant in a purple terracotta pot. Contains a combination of one dozen yellow, orange, red and bicolor fresh-cut long-stemmed roses accented with yellow solidaster. Contains 9 Orange Roses, 7 Pink Carnations, 6 Orange or Yellow Carnations, 3 Pink Mini Carnations, and accented with Purple Statice. Includes One dozen fresh-cut, long-stemmed pinkish orange roses accented with Baby's Breath. Contains 12 long stemmed assorted colored Roses with 4 stems of Hypericum clusters and 3 stems of dark green Ruscus. Contains 12 long stemmed Red Roses with 8 stems of Hypericum clusters. Includes One dozen fresh-cut, long-stemmed roses accented with Baby's Breath. Includes two dozen fresh-cut, long-stemmed roses accented with Baby's Breath. Includes an assortment of one dozen fresh cut, long-stemmed roses accented with Baby's Breath. Includes 4" potted Mini Red Rose within a decorative heart covered sleeve. Includes One dozen fresh-cut, long-stemmed bi-colored orange and yellow roses accented with Baby's Breath. 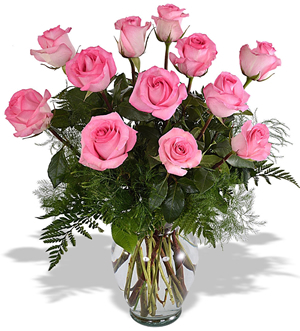 Contains 9 Pink Roses, 5 Pink Alstroemeria, 7 Butterfly Asters, and greenery. Includes 24 Premium Dark Pink and Red South American Roses, 3-5 Limonium, and loads of greenery. An elegant extra large premium glass vase compliments this bouquet. Contains 12 extra long stemmed Pink Roses, 4 stems of Pink Oriental Lilies, 5 stems of white Phlox, 5 stems of green Hypercum berry clusters, and green Bupleurumn to fill it out. Includes Two dozen fresh-cut, long stemmed assorted roses accented with Baby's Breath. Contains 15 stems of assorted colored Spray Roses. Includes 24 Premium Vendela Roses, 3-5 Limonium, 3-5 clusters of Bear grass. An elegant extra large premium glass vase compliments this bouquet. Includes two dozen fresh-cut, long-stemmed pinkish orange roses accented with Baby's Breath. Includes 6 long stemmed Red Roses, 6 long stemmed Pink Roses, 5 stem of Red Spray Carnations with purple filler and complimented with lush greenery. Includes 4" miniature red rose with a decorative patriotic mylar, and a mini American Flag. Plant measures approximately 8-10" tall. Contains a combination of two dozen yellow, orange, red and bicolor fresh-cut long-stemmed roses accented with yellow solidaster. Contains red Roses, pink Nerine Lilies, pink Stargazer Lilies, pink or red Hypericum berries, red Cockscomb, white Trachellium, and lush greenery. Comprised of 20 breathtaking Tulips in a mix of pink, white, dark pink. Comprised of 8 Blue Iris, 5 Coral or Pink French Tulips, 5 stems of White Oriental Lilies, and greenery. Includes an assortment of 15 Tulips. Includes an assortment of 30 Tulips. This Gardenia Plant is planted in a 6" diameter pot and comes within a plain wicker basket. Includes 4" purple hydrangea plant with a daisy and polka-dot planter box. Hydrangeas prefer room temperatures with a fair amount of sunlight. Includes one Potted Purple or Pink Phalaenopsis Orchid within an elegant ceramic pot. Measures approximately 12"-14" tall. Includes approximately 20" high Asiatic Lily within a 6" diameter wicker basket, and should include care information. To ensure best quality, colors may vary. Dwarf Jade (Portulacaria Afra) is 3 yrs old, stands 6-8" tall, and is accented with a Dwarf Horsetail plant. Pot size should be approximately 10" in diameter. Humidity tray should be included. Dwarf Jade is a tropical plant and is one of the easiest trees to grow. It is also well adapted to low light and tolerant of short periods of dryness. Place indoors near windows facing southeast or west. In warm weather, bonsai will grow best outdoors. Never allow bonsai to freeze. Though it mainly blooms during the spring, this Azalea will produce periodic blooms summer thru winter. Easy to care for and interesting to learn about. Contains a 3 year old, living Satsuki Azalea (Rhododendron indicum 'Chinsan') approximately 8" in height. Pot measures 8" in length. These Satsuki Azaleas bloom later in the spring than other azaleas, extending the season. Plant will produce periodic blooms during the other seasons. For best results, place Bonsai outdoors in a spot that receives morning sun and afternoon shade. Outdoor bonsais can be placed indoors, but only for short periods of time. Do not leave bonsai inside for more than five days. Native to both Asia and the Americas, the Hydrangea has become a popular mainstay in many garden designs. 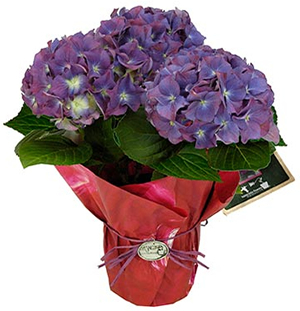 The name Hydrangea is derived from Greek, referencing its aquatic and marsh origins. Flowers produce blue and pink colors in bold, round clusters. Another member of our 'potted' plant family, these potted Hydrangeas offer a remarkable amount of color in showy balls that crown their large, broad leaves. Arriving up to 24" inches tall, and able to reach many feet, this stunning plant comes in a 6" terra cotta pot. Hydrangeas prefer room temperatures with a fair amount of sunlight, with an acidic fertilizer profile. This plant is well suited for patio containers, and is certain to reward your recipient with long lasting splendor. Contains a pink Cyclamen plant in 4" decorative pot. These unique Chrysanthemums resemble tiny sunflowers. 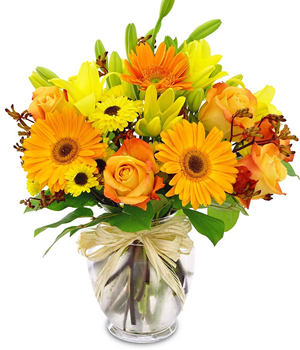 Cheerful and long-lasting, this gift is perfect for the autumn season. Plant measures 6" in pot size and should come in a basket. Includes approximately 12" high Gerbera Plant within a 6" diameter plain wicker basket. The Chinese Evergreen has beautiful silvery green patterned leaves and loves low-light conditions. An ideal indoor plant, the Chinese Evergreen makes a wonderful addition to your home or office. The Chinese Evergreen is in a 6" plastic pot within a lined antiqued metal planter.